Can you help create biographies for the heroes on this Memorial? 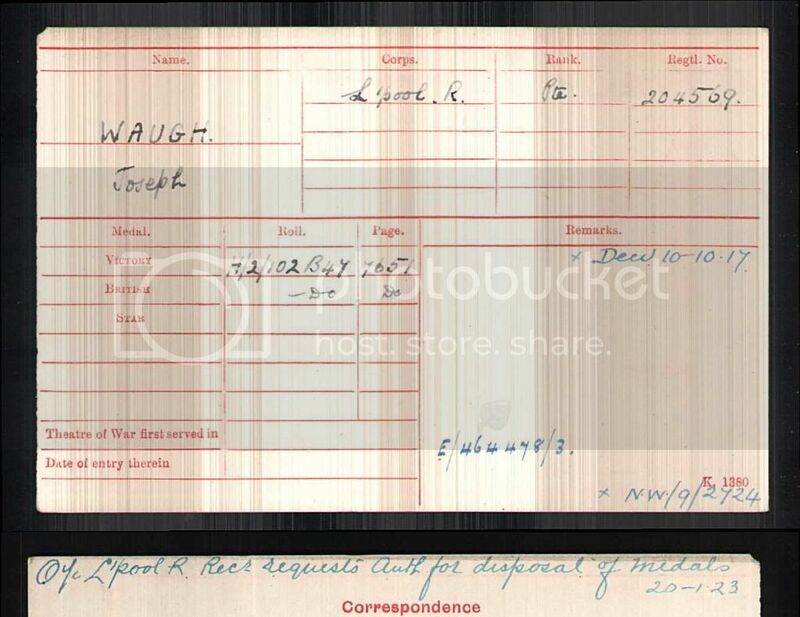 J. Waugh, private, 204569, 5th Battalion, King's Liverpool Regt., d. 10 Oct 1917, bur: B, Old Yard, 10, St Anne's, Stanley. Last edited by daggers on 03 Oct 2017 22:29, edited 1 time in total. possible - although the address in Egremont isn't promising! Regiment/Service: King's Royal Rifle Corps 1st Bn. Grave Reference VI. A. 14. WAUGH, Evelyn Gladys Dtr 19 1892 - Seacombe. BROWN, William, Father-in-law and BROWN, Elizabeth, Mother-in-law, and 5 more Browns. Emery, McAnaspie/McAnaspri etc, Fry, McGibbon/McKibbion etc, Burbage, Butler, Brady, Foulkes, Sarsfield, Moon [Bristol & Cornwall]. When you are decided which hero is the correct one, anybody with incorrect entries can simply delete their own post using the X at the bottom right corner of the box. one off Torr Street, Everton, the other in the Old Swan area. I don't think the soldier from Egremont is the J.R. Waugh on St. Cryprian. My gut instinct is the Soldier from the Old Swan Area. And I have just checked the Schedule for the 1911 and it is Rock View, Old Swan. Just need to confirm. I have located a marriage between Richard Joseph Waugh and Elizabeth M O'Reilly in 1910 WDRO Registrar attended. I need to check the entry in the Liverpool Echo and go from there. Elizabeth Knowles aged 22 daughter of Thomas Knowles a Cooper dec. I can't locate a Richard Waugh on the 1901 Census so if anyone can assist. William Waugh who is the father of Richard and Joseph Waugh is residing in Binns Road, Wavertree in 1911. Marriage on 16 April, 1910 at St Oswald. We can rule out Richard Waugh just found his burial at Yew Tree Cemetery in 1958 Address is given as 76 Childers Street, Old Swan. Thanks Mary that confirms Richard Joseph Waugh and Joseph Waugh are brothers. Just need to get the connection to St Cryprian. It will have to wait till I get down the Archives and look in some directories. I know this discussion was a while back, but thought folk might like to know that on Sunday 8th Oct, (as the closest Sunday to his death) following our Parish Eucharist at 10am we shall be remembering Private Joseph R Waugh 204569 with a procession to his grave, the choir will sing 'We will remember them' and the Last Post shall be played. Members of the King's Regiment shall also be in attendance. Folk are more than welcome to join us in this memorial of 100 years since he gave his life. and that his grave is at St Anne, Stanley, Prescot Road.